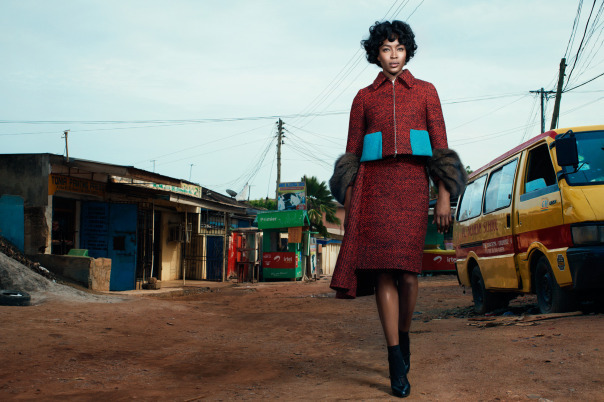 A decidedly grown-up feeling is currently being channeled by Naomi Campbell and it was for a diplomatic mission to our beloved Ghana. For an editorial in the November issue of W Magazine, carrying the modern ladylike trend to perfection, the supermodel wore a first-lady worthy wardrobe filled with exquisitely tailored suits in simple, clean silhouettes that were beautiful to look at. The photos were taken in scenic Accra, Ghana; including the University of Ghana (Legon), The National Theatre, Movenpick Hotels, MarketSquare and other locations. According to the Style Editor, W magazine, Edward Enninful, “It’s a tribute to a modern day First Lady on a state trip, evoking the kind of timeless style that could have existed in the 1940′s, 60′s, or even today. See the pictures for yourself and let us know what you think.